I’m an award-winning writer, editor and teacher of science fiction and fantasy. I’ve published nine novels and a host of short stories in leading SF&F outlets. In addition to writing, I’m strongly interested in math and geology. In my spare time, I teach kung fu to kids and (unsuccessfully) to my rabbit. 2017’s All Those Explosions Were Someone Else’s Fault is the first novel in James Alan Gardner’s new Dark versus Spark series. Kim Lam came to the University of Waterloo to reinvent themself, to go from gender to assertiveness. Thanks to some Mad Science, they will succeed beyond their wildest dreams. For more than a generation the Dark Pact had publicly offered power and immortality to the rich. Hand over enough money (perhaps your soul as well) and you could be reborn as a creature from nightmares. Vampires, werewolves and demons walked among us … or rather, they ran all the Fortune 500 companies. Oligarchs, demons, same difference. Kim once dated Darkling-to-be Nicholas Vandermeer, only to discover that the will to power trumped any affection Vandermeer might have had for his practice lover. It’s a mistake Kim is trying very hard to put behind them. Their first thought on seeing a collection of Darklings headed towards a lab at O Dark Thirty was to try to convince themself that the Darklings were merely fellow students pulling an all-nighter. Not Kim’s business — at least not until the Darkling lab exploded. Accompanied by physics student Miranda Neufeld, biology student Shar Chandra, and biology student Jools Walsh, Kim does their best to save the Darklings. They fail to save anyone, but they do emerge from the wreckage of the lab imbued with otherworldly energies. Each of the fantastic four — excuse me for a moment, there’s a lawyer from Marvel at the door — each of the cosmic quartet gains their own suite of superpowers. Gone Kim, Miranda, Shar, and Jools. Enter Zircon, Aria, Dakini, and 99. The Dark, you see, does not have the world to itself. It is opposed by the Light, which grants abilities rooted in superscience to a lucky few known as Sparks. Nothing is ever free; with great power comes great — sorry, another knock at the door — enormous ability carries with it the duty to use it productively. In the case of superheroes, that means saving their chosen territory1 from evildoers. Not all of whom have joined the Dark Pact. That explosion was no accident. It’s only the opening play in a wider scheme. It’s up to the four to work out the identity of the player on the other side and figure out what they are planning, and how to stop it. All of which must be done quickly, before the mastermind obliterates the population of Waterloo Region. “The population of Waterloo Region” may not seem important to you. I am part of it (assuming that my tendency towards bold, forthright action hasn’t pruned that version of me out of Kim’s timeline) so it’s pretty important to me. It would be very convenient if every member of the Dark Pact were a villain who could be counted on to do bad things and if every Spark were a saint. Such is not the case. The Dark tries to limit the abuses doled out by Pact members (if only because they know that they are vastly outnumbered and that mobs with flaming torches are always an option). Also, their wealth depends on a stable economy. Those Sparks known as Mad Geniuses, on the other hand, are perfectly able to take principle well into irrational obsession territory. This book’s version of the University of Waterloo isn’t quite our timeline’s University of Waterloo. The buildings are not named for politicians and prominent academics, but for various generous Darklings. (At least, that’s true of the STEM side of campus. We don’t see much of the Arts side.) The campus layout seems to be much the same, so persons familiar with the campus can have fun working out which building is which. The book does not mention the infamous steam tunnels of UW, but it seems likely that they exist. Perhaps a future instalment in the series will reveal what lurks inside them. The four recently created Sparks are typical of much of the student body, kids devoting themselves to projects ranging from self-reinvention to self-destruction. How the acquisition of superpowers will affect their grades remains to be seen but I expect the answer will be “poorly.” Unless the University of Waterloo offers a superpower curriculum for those who save the day whilst causing massive amounts of property damage. Perhaps the book’s UW does have such a program. I wonder what it would be called? The first new published novel from JAG since 2005’s The Man of Bronze, this is a welcome end to the great drought and a promising beginning to a new series. 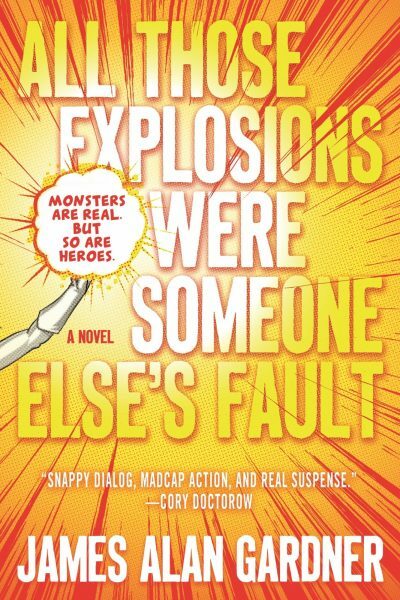 All Those Explosions Were Someone Else’s Fault: A Novel is available here (Amazon) and here (Chapters-Indigo). 1: Sparks are extremely territorial, which raises the question of whether the four new Sparks have adopted the entire Waterloo Region, or whether they restrict themselves to protecting the city of Waterloo. While the four do venture into distant Woolwich Township, a majestic six kilometers north of the University of Waterloo, a quick search of the review pdf reveals the total absence of the word “Kitchener.” Either Kitchener is entirely on its own or, more likely, there’s some green-felt-capped, beer-themed adventurer skulking on rooftops near King and Benton Streets. One who doesn’t want help. It's nice to see a new book from Garner, I really liked his SF series with the interstellar thingy that killed anyone who had killed, and all the ways the military etc. worked around that. GG dates back to 2001? JAG used "Sparklord" in his 2002 novel Trapped, and I believe he was using Sparklord and Spark in homegrown RPG campaigns before that. I believe this is just coincidence, not a hat tip to GG. GG actually DOES date back to 2001! I know that JAG was using "Spark" and "Spark Lord" in his writing before I was married, and I was married in 1990. I suspect but do not have it handy to check that the word "Spark" shows up in "Children of Creche," the story with which he won the Writers of the Future contest in 1989. (My copy of Gravity Wells is inconveniently Not Here.) I know that "Spark Lord" shows up in Expendable, published in 1997, and probably in Commitment Hour, in 1998. In "Fanny Hill" (1748), a book that you wouldn't want your servants to read (which I believe was said as a joke), any of the "boyfriends" of Fanny and her friends may be referred to as a "spark". That's a different kind of fantasy... and, yes, I read all of it. I care, I like that system. Fair enough, I read Trapped but I must have forgotten it. Well, there is another possibility for the defense of Kitchener in this setting: Evildoers have a habit of being foiled through various unlikely happenstances and there is this poor innocent bystander who always seems to be randomly caught up in it, (often requiring some level of medical attention).